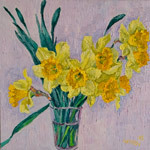 Please look at my new flower paintings. 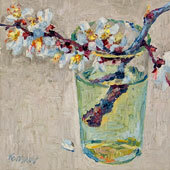 There are the miniature works done with a limited palette of colors. Flowers are painted on a background, not made with lines, but with color. So there is softness about the picture that emphasizes the contrast in the flower's colors. Also please look at my winter and spring landscape. They look peaceful and extremely realistic, vivid with strong and warm colors. Most paintings are done with a square canvas. OK, back to the easel. Enjoy. 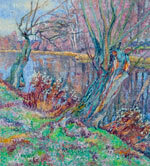 Please come and join to see my paintings.